WASHINGTON - Technology and social media have dramatically reshaped the United States over the past decade and Americans have mixed feelings about the changes, according to a deep dive into those topics in the latest NBC News/Wall Street Journal poll.More than a decade after the smartphone arrived in our pockets and our palms, people say they are hopeful about changes tech may bring, but unhappy with the impacts social media has had on politics and their lives.Overall, 60 percent of those surveyed said they are "more hopeful" than worried about the changes that technology could bring in the next five years, but they find few nice things to say about social media. 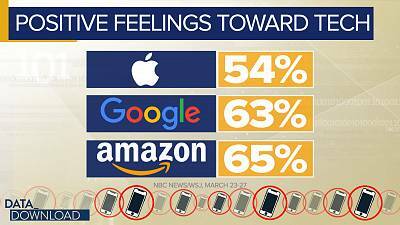 You can see the split when you look at people's feelings about the nation's biggest tech companies. 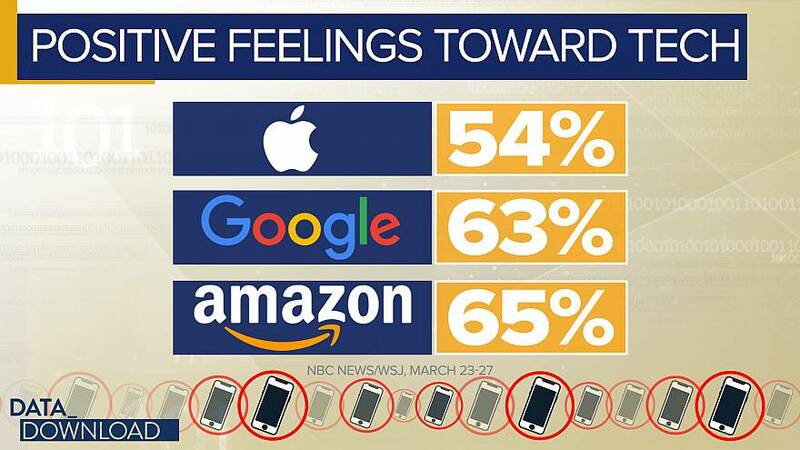 Majorities of Americans say they have positive feelings toward Apple, 54 percent, Google, 63 percent, and Amazon, 65 percent. Those are the companies that put smartphones in peoples' pockets, direct their Web searches and deliver goods to their door.But the numbers drop precipitously for the two big social media companies. Only 36 percentof Americans say they have positive feelings about Facebook, while less than a quarter, 24 percent, say they have positive feelings about Twitter.What's driving those negative feelings? Four points emerged in the poll. What\'s driving those negative feelings? Four points emerged in the poll. More than 8 in 10 of those surveyed, 82 percent, said social media "wastes our time." Another large number, 61 percent, said social media outlets "spread unfair attacks and rumors." 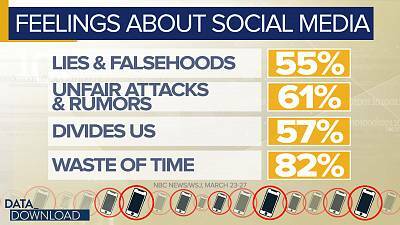 On a similar topic, 55 percent said social media "spreads lies and falsehoods." 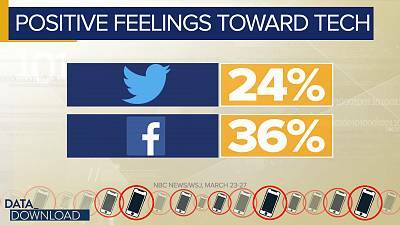 And maybe most damning for the outlets, 57 percent said that social media "divides us. "That's a pretty negative set of views and it doesn't get better on the question of people trusting social media companies with their information, particularly Facebook. That\'s a pretty negative set of views and it doesn\'t get better on the question of people trusting social media companies with their information, particularly Facebook. A full 60 percent of Americans say they do "not at all" trust Facebook to protect people's personal information. 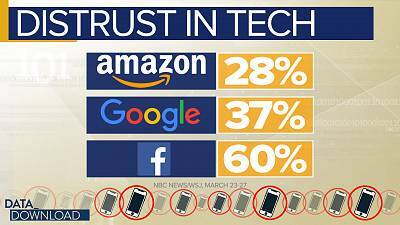 That number compares poorly to figures for other large tech firms -37 percent of Americans say they do "not at all" trust Google and 28 percent say that about Amazon - and even compared to the federal government. Overall 35 percent said they do "not at all" trust the federal government to protect personal information.But the most remarkable finding in this poll may be the partisan splits on social media: There aren't any - at least nothing major. In an age where almost any issue or topic shows a red/blue divide, there's not a lot of room between where Democrats and Republicans stand on social media. Majorities from both parties agree that social media wastes time, spreads unfair attacks, spreads lies and falsehoods and divides us. There are some gaps in the numbers and Republicans tend to be a bit more down on social media overall, but it's rare to find that kind of broad agreement on any issue in 2019.And those common beliefs extend to thoughts about who's better are safeguarding personal information. Both Democrats and Republicans trust the government more with their personal info than they trust Facebook - and by very similar margins.The numbers suggest that we may have found one "uniting issue" that a smart candidate can build a successful 2020 campaign around, capturing support from everyone.And when the candidate builds that campaign, he or she can announce it on … social media. Because there is one more point where there is broad agreement on social media, across the two major political parties, men and women and all income ranges.Despite what people say about social media, large majorities of those groups, more than 60 percent, and many others, say they use it at least once a day.